I don't think there is any better way to bring your loved ones together this Holiday season than over chocolate. And not just any chocolate…. we're talking about the crunchy, the smooth, the hazelnut-y, the fine, Ferrero Rocher. 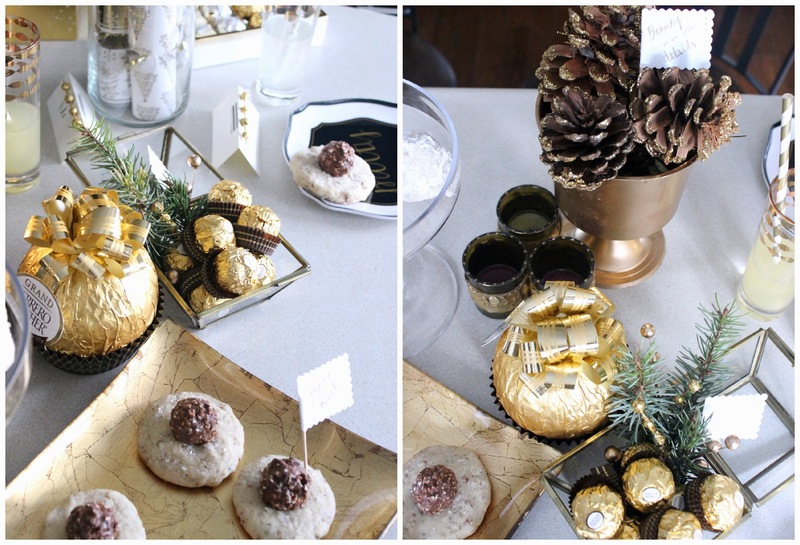 Last weekend I curated a whole spread revolving around the golden Ferrero Rocher. It was complete with the chocolates, some of my favourite Christmas cookies (taken to a whole new level) and some DIY Holiday decorations. It was the perfect way to kick off the Holiday season and spend time creating magical memories. 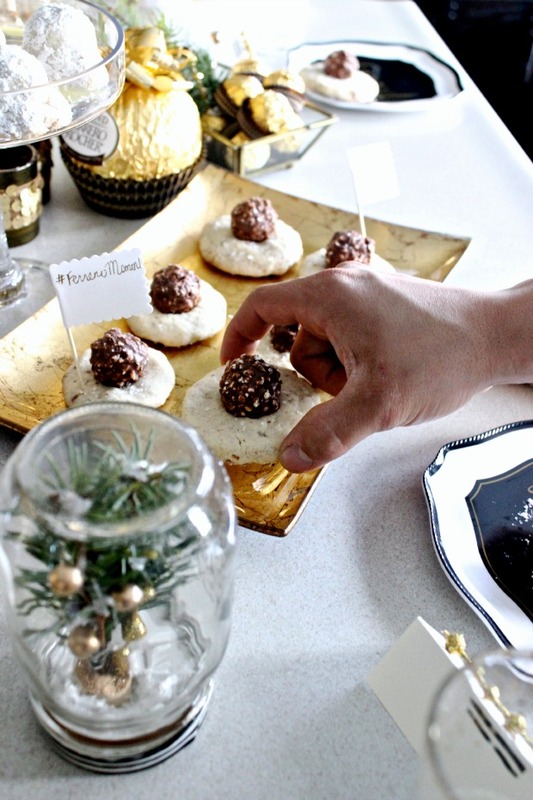 Here's how I created my #FerreroMoment. Receiving a box of Ferrero Rocher can really make anyone feel special. I wanted the table to evoke those same warm feelings so I stuck with the golden colour theme. 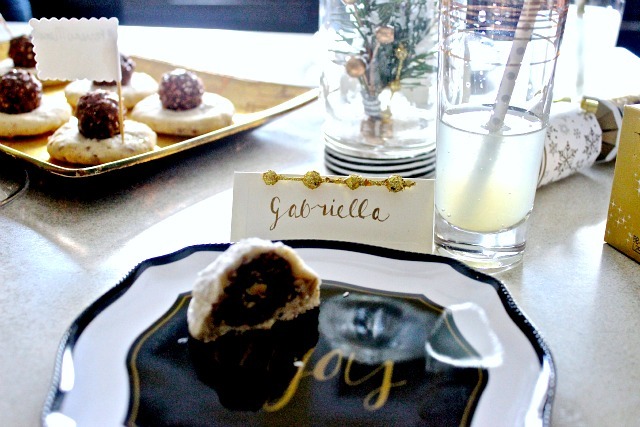 Personalized name cards were set for each individual and to add in that special touch of Ferrero gold, I glued some glitter sticks to each of them. The names were written in my golden attempt at faux calligraphy. What I also love about the collection of Ferrero chocolates, is that they are packaged so pretty! The gold wrapping, the pretty bows; I basically didn't even need any added decor elements since they act as decor elements on their own! I must admit, I am obsessed with the Grand Ferrero Rocher. It's actually a huge milk chocolate shell, with the infamous hazelnuts pieces, and two Ferreros are found in the middle! Amazing, right?! 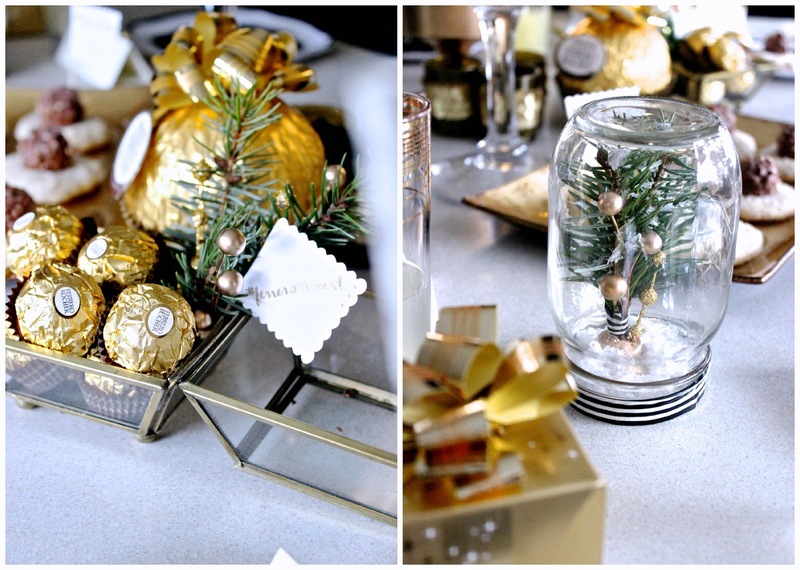 Add some of the packaged Ferrero Holiday products to the tablescape for a touch of mystery and sparkle. I love adding outdoor elements like pinecones (dressed in glitter), and pine tree sprigs to create a more cozy and homey feel. I also made up a DIY snow globe in a matter of 2 minutes. I stuck some of the pine sprigs into a wine cork and then taped the bottom of the sprigs together using washi tape. I added more of those golden and glittery sticks to the cork and glue gunned the cork to the inside of a mason jar lid. I threw in some fake snow and glitter and sealed the jar up. Ta-da! So easy-peasy. 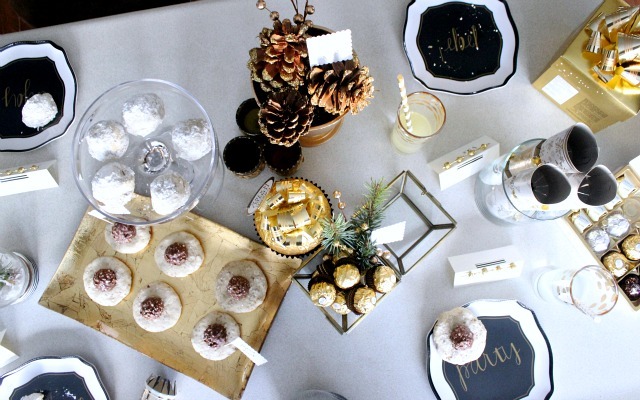 Golden accessories such as champagne flutes, vases and candles all make sweet additions to the tablescape. Can't forget the Christmas crackers and party straws for fun! I love that the Ferrero Golden Gallery has a chocolate for everyone. The classic Ferrero, the Tenderely White (white chocolate), the Rondnoir (dark chocolate), and the Manderly (crispy wafer with a whole almond). But since baking is pretty mandatory for me during the Holidays, I wanted to take the Ferrero and combine it with a classic Christmas cookie; the shortbread. And to really elevate the scene I did them two ways. Don't worry, it's the same dough, so totally a time saver! The first way is to bake the cookie and place the Ferrero on top as soon as you take it out of the oven. 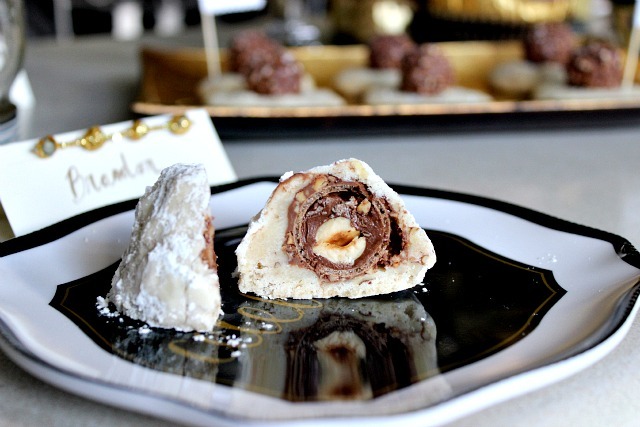 The second way is to wrap a Ferrero into the shortbread. You're guests will think it is just a shortbread and will be blown away when they taste that oh so familiar Ferrero chocolatey centre. And I know what you're thinking… "doesn't it melt?!". Check out the pictures and you will see just how beautiful these little creations are! In a large bowl beat butter, sugar and vanilla until light and fluffy. Add flour and nuts, beat on low speed until blended. Here is where the instructions change depending on the cookie variation. Place 1 tbsp of flattened dough on cookie sheet. Bake 10 minutes until only lightly brown on bottom. 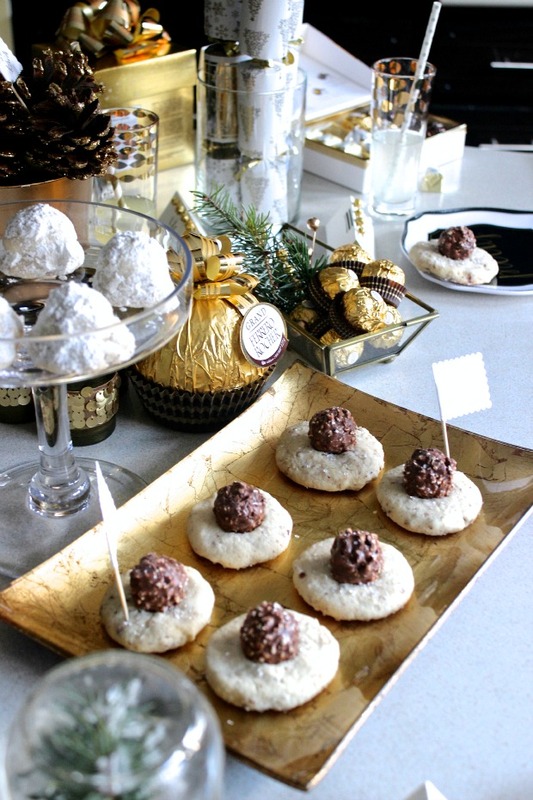 Immediately add 1 Ferrero Rocher to cookie, and sprinkle with crystallized sugar. Shape 1 tbsp of dough around each Ferrero. Bake 10-12 minutes until set, again only lightly golden on bottom. Roll cookie in powered sugar while warm, but not hot. The Holidays are the perfect time to celebrate the special, little moments. Why not get together "just because" this season? What do you think of my Ferrero Moment? Let me know if you have any questions on how to bake the cookies. And make sure to tag pictures of your #FerreroMoment, too! This post was created in collaboration with Ferrero Rocher Canada. Thanks so much, Joëlle! 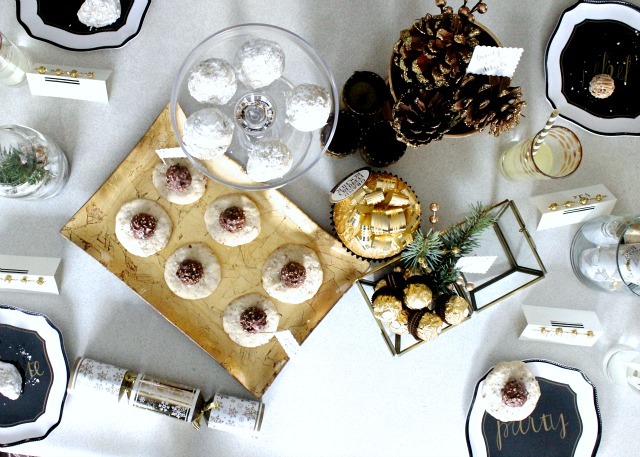 Hope it inspires your Holiday entertaining! UMMMM can you set up all my events lol- lovely! Thanks for stopping by, Brooke! So delicious! Can't go wrong with fine chocolate! This post is AMAZING! First of all, I absolutely love the table set up that you were able to put together. It's gorgeous and so festive. Second, those treats look insanely delicious and really make me question why I haven't baked with Ferrero before! Aww, thanks so much Jackie! I'm so happy you love the look of the table. I am a huge fan of gold! 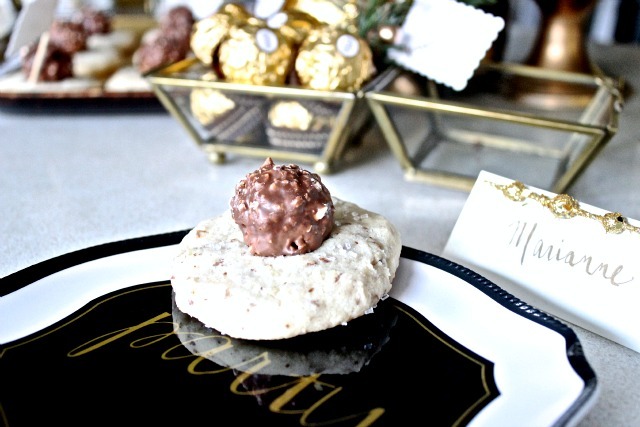 You need to get baking with Ferrero Rocher! SO good! This is such a fantastic layout! Loving the theme! Thanks, Kris! So Holiday, right? Looks delicious!! 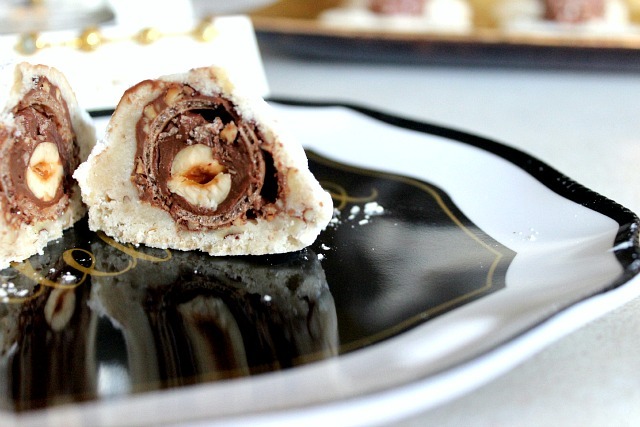 I will have to try out the recipe, but first lets talk about the Grand Ferrero??? OHEMGEE! I KNOW! Cracking into that Grand is a Holiday in itself!